Welcome to my Monthly Stamp Study. This is my 11th month of doing this series. Every first Saturday of the month, I choose a stamp set and make different designs. Since this stamp set is part of the August Card Kit, I utilized almost all the pattern paper and supplies from this card kit. By using paper-piecing, I created a pair of fun flip flops. 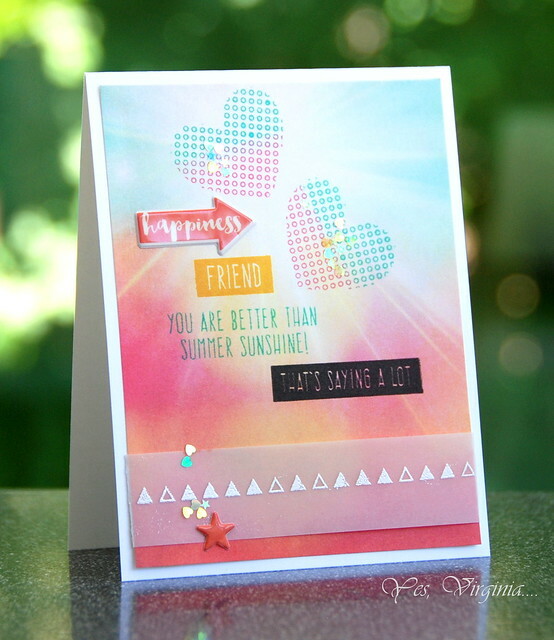 I also did an inlaid diecut for the word "sunshine" which was included in the card kit. I wanted to create a watercolored sentiment. 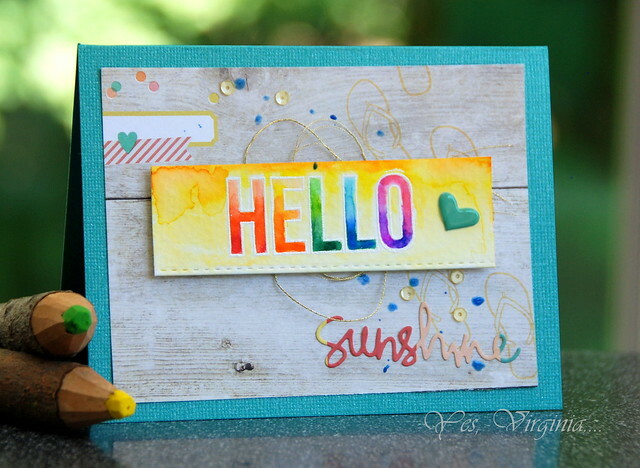 I first embossed the sentiment "HELLO" in white on watercolor paper. I then applied watercolors with Spectrum Aqua Markers. Since this card kit comes with so many yummy pattern paper, I wanted to use these fun images. I only had to stamp the flip flops and added the burlap for texture. I actually made a video for this card, to my own surprise. I felt bad that I have not been posting any videos and every day, I get some e-mail notices telling me that I have NEW subscribers!! What!? So, I got brave and made one! You can watch it here. I hope this happy summery post adds some sunshine to your day! edited (on Aug. 2, 10:45am): Thanks for the love, everyone! Your comments make a huge difference. This morning, I got a thumbs-down on the video (out of 11 thumbs-up). I just changed the setting of my video. Sometimes it hurts less not seeing the "truth". This might be the last Stamp Study, given the few/poor response and comments I get. It's been a good ride. I'm so impressed with the number of ideas you've come up with using this stamp set and kit! Card #5 is my fave, but I really do love them all, Virginia! Thanks so much for another great video, too! The technique you used with the flipflops is wonderful! Super cute card! I'm sooo happy to see you have a video up!! Thumbs up :) Thanks for the inspiration, I love your work! Virginia,you are so kind to share your cards with us and give the wonderful tips to making them. You are so easy to follow with your kind voice. I love your videos. I don't make many cards,but each time I see one of your videos I'm encouraged to try to do more. Always enjoy reading your blog and hearing about your family. Have a nice week ahead. gr8 cards... virginia... and this is wat i tell myself sometimes.... Erase the negatives out of your Life... It tells every one of us that some people love the negative about themselves.. always comparing and envious of those that have gr8 success... I have to watch my own attitude here... i just felt to share that rude comments can be erased before they hit our hearts and knock us over... Keep climbing and i hope the sun is shining extra bright for you today:) Courage....:) I love your inspiration and ideas.. it amazes me and gives me courage to try. I dont have a lot of money for stamps but i find i can draw some i cant buy so thats awesome.. i love ink and find paper and other supplies more necessary...3 cheers... love 2 u from "glow"
Thank you for sharing your cards, ideas and videos. Seeing others work and how they create is inspiring. Clever girl...this is a very effective technique. The card is fun and happy. Love how you combine your knowledge and explain yourself so well. Those are negative are just sorry they can't do as well as you do. Turn them off, because they just try to elevate themselves by hurting others. I call that cowardly and mean, especially in this format. They know you can't fight back so they use this as a forum for their petty, little existence. They are NOT to be acknowledged. I am so totally impressed with the goodness that came out of this Stamp Study - amazing cards - each one unique and with something that lets it stand alone but then when you look at them as a group they all compliment each other!! You have showcased this set in such a GRAND way!! So much goodness packed into one post!! So many ideas to take note of and inspiration to go and create something lovely like you have done!!! What a great set of cads! I especially love the one with the bit of burlap, great texture! I'm another one of your many fans - I'm sure your nervousness about posting videos will subside as you post more of them. You're VERY good at them; your talents shine through and your creativity is always an inspiration to me. Don't let the meanies get you down! Love all the different ways you used that stamp set & kit. 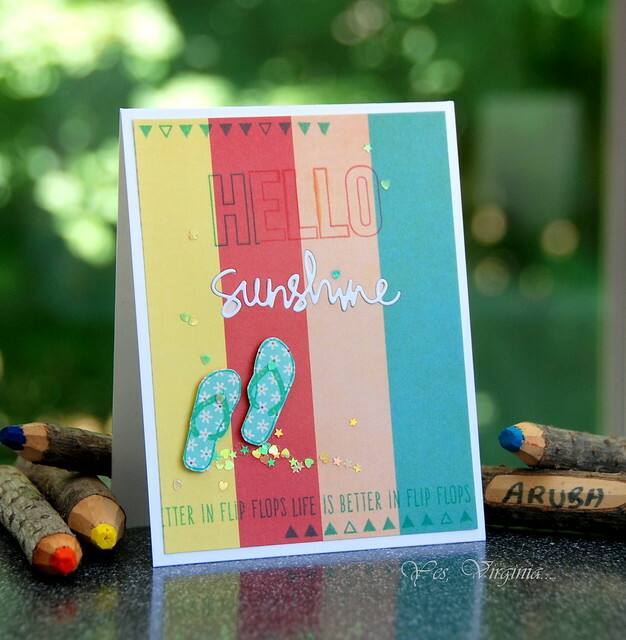 Love the Pico Embellisher on the heart and those fun flip flops out of the print paper. I do enjoy your Stamp Study Posts. Virginia, you can bask in the knowledge that your video was AWESOME and your cards simply fabulous! I so enjoyed watching and listening to you create; indeed, if I had the same supplies, I'd be crafting right along with you - that's how engaging and 'user friendly' you video is! Even though I don't comment as often as I should, I follow you via Feedly, and all your creations receive plenty of gazing and admiring! Looking forward to more videos; you rock! I really enjoyed your video. Thank you for taking the time to show us all your fun cards. I love the name "potluck card" I think I am going to have to use that. Don't stop sharing your works of inspirational creativity. I thoroughly enjoyed watching how you made that flip flop card. I never knew to use the backside of the stamp, so you taught me something. Keep up doing videos, and I will be eagerly following. 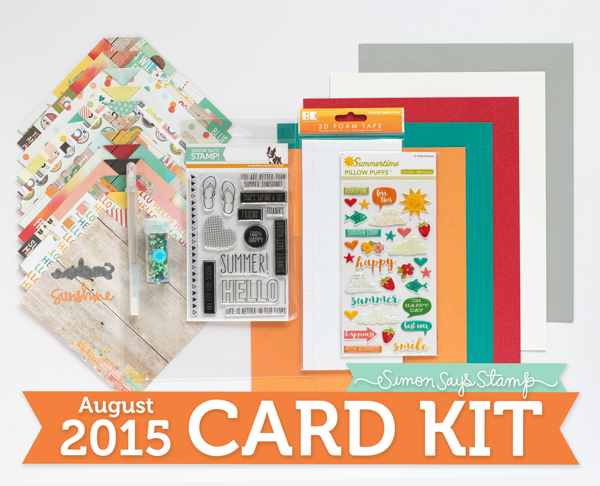 Just found your blog after looking at the cards on the Simon Says Stamp August Card Kit gallery. 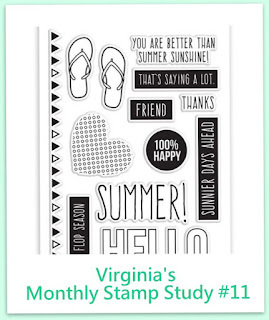 Love your idea of doing a stamp study, and the different ideas you came up with for the flip flop season stamp set. Don't let the negative people get you down--so many people on the internet feel it is okay to criticize others' work, but are too scared to post their own...if they even do anything other than surf the web! Jealousy makes them mean. I think your cards are great, and I'll be checking out your video next!